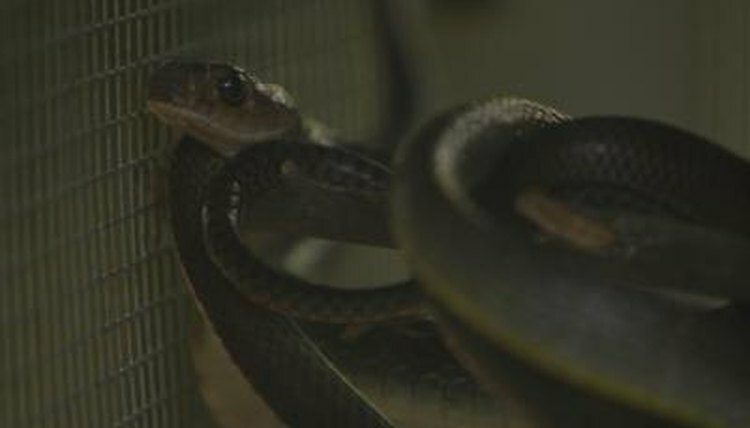 Pet stores don't often stock cages designed explicitly for snakes, but they do usually carry a variety of aquariums. Though these glass cages are heavy, fragile and designed for fish, they can provide quality housing as they are easy to clean, affordable and offer exceptional viewing opportunities for the keeper. The biggest challenge to using an aquarium is finding an appropriate screen lid. Making your own top is often the only option, though it can be difficult to devise a method of securing the lid. To prevent a snake from escaping, use plastic bolts to secure the lid. Measure the length and width of the aquarium. Use the outside dimensions, as the screen lid will sit around the outside of the aquarium rim. Be sure to measure your specific aquarium, rather than consulting a chart of standard sizes. Aquariums offered by different manufacturers can differ by more than a quarter of an inch, which may produce enough of a gap to allow a small snake to escape. Cut the 1-inch by 2-inch lumber for the frame. The two shorter, end pieces should measure exactly the length of the ends. The longer two pieces should be cut to a length equal to the length of the aquarium plus twice the width of the wood. In the case of a 1-inch by 2-inch board, the actual measurements are 3/4-inches by 1 1/2-inches. For an aquarium that measures 12-inches by 20-inches, the frame would require two 12-inch pieces and two 21 1/2-inch pieces. Flip the aquarium upside down, and place the framing lumber around the perimeter of the aquarium. Ensure that all lengths are correct and make any adjustments that are necessary. Glue the edges of the frame together with the wood glue. Allow the glue to dry before continuing. Place the 90-degree metal plates on the bottom surface of the four corners of the lid. Use the cordless drill to drive the screws through the holes in the bracket and into the wood. The brackets will contribute additional strength to the corners. Make sure the frame slides on and off easily, yet doesn't provide any large gaps. Use the wire cutters to cut the hardware cloth. The hardware cloth should fit the frame completely. Use the outside dimensions of the frame so that the cloth completely covers the frame. The above example would require a piece measuring 21 1/2-inches by 13 1/2-inches. Staple the hardware cloth to the top side of the frame with the heavy-duty staple gun. Cut off any excess hardware cloth or rough edges. Test the lid and make sure that it fits securely, but is easily removed. Be sure there are no sharp edges or exposed screws. Place the lid on the aquarium and drill two 1/4-inch holes on each of the short ends. Each hole should be about 1 inch from the corners. Place the nylon screws through the holes. Cut the excess length so that when the screw is fully seated, it contacts the glass.The lid will now stay secure unless the bolts are removed enough to allow them to pass by the aquarium's rim. Place the snake in the cage, replace the lid and tighten the bolts.  Hardware cloth can be difficult to cut, so invest in some heavy-duty wire cutters. ⚠ Don't use this design with very small snakes; they may be able to escape through the 1/4-inch gaps in the hardware cloth. ⚠ Don't over tighten the nylon screws or the glass may crack. ⚠ Be sure to go over the lid carefully and look for gaps that may allow the snake to escape. Can a Guinea Pig Stay in an Aquarium? Can Bearded Dragons Be Kept in Homemade Enclosures? What Kinds of Reptiles Can Live in an Aquarium?